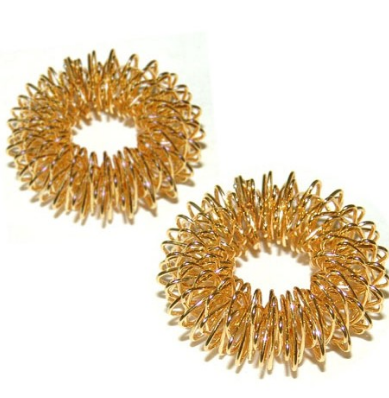 Massage rings have been designed for intense stimulation of fingers and toes. They are used if a great number of correspondence points are to be stimulated simultaneously. Since fingers and toes are the miniature projections of the limbs (in the main hands-and-feet correspondence systems) and of the whole trunk (as in the "insect" systems) - not only does the fingers/toes massage make it possible to cure diseases involving the entire arm or foot, but it can also produce a curative and most beneficial effect on the body. As the massage ring is put on a finger or toe, it should be vigorously rolled to and fro until there occurs a sustained hyperemia and sensation of warmth. When the stimulation is completed, the ring should be taken out. We deal in all kind of acupressure, acupuncture. Goldtouch Enterprise established in the year 2017. We offer different and easy options of payment keeping in mind the convenience of our valued customers. The customer-focused approach has enabled us in establishing a broad client base across the market. By using upgraded tools and rigorous methods, the unmatched quality of the offered product is never compromised.